Final results in Israel's election show the moderate Kadima Party has one more seat in the new parliament than Benjamin Netanyahu's hawkish Likud. Kadima won 28 and Likud 27 in the 120-seat parliament. Tzipi Livni celebrated her party's slim victory at the polls over Netanyahu, but that may be all her supporters have to cheer about, reported CBS News correspondent Richard Roth. What she'd need to govern as Israel's first female prime minister in more than thirty years is a strong coalition of rivals to back her in parliament, and she'll have trouble getting that. The parliament has a majority among hard-line parties, making it easier for Netanyahu to form the next government and take over as prime minister. Netanyahu opposes talks on a peace treaty with the Palestinians. One possibility is a joint government. 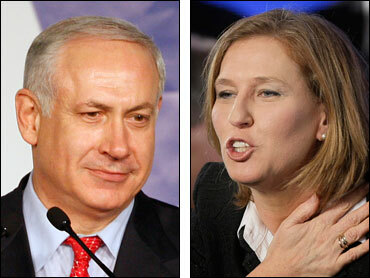 Netanyahu would be prime minister, while Livni and her party would receive key government ministries. The results set the stage for what could be weeks of coalition negotiations. The first meetings began Wednesday, with Netanyahu meeting the head of the ultra-Orthodox Shas faction. Whatever government is forged, it is unlikely to move quickly toward peace talks with the Palestinians and instead could find itself on a collision course with President Barack Obama, who has said he's making a Mideast peace deal a priority. "President Obama looks forward to working with whoever makes up that next Israeli government in a search for lasting and durable peace in the region," White House spokesman Robert Gibbs said Wednesday. "Like our own democracy, I think whether it's turbulent or tumultuous times or bad weather, did not seem to deter millions from voting yesterday. I think that's the sign and strength of a strong democracy," he added. But Israeli governmental paralysis could dampen prospects for Egyptian-led attempts to broker a truce between Israel and Gaza's Hamas rulers after Israel's devastating offensive in Gaza last month. Hamas might be reluctant to sign a deal at the risk of having it overturned by the incoming coalition. It's up to Israeli President Shimon Peres to decide whether Livni or Netanyahu should have the first shot at forming a government. Peres will meet next week with party leaders to hear their recommendations, and around Feb. 20 expects to assign the task, presidential spokeswoman Ayelet Frisch said. Once he makes his decision, the prime minister designate has up to six weeks to form a government. President Obama spoke to Peres Wednesday afternoon, the White House said, congratulating the Israeli people on the elections and lauding "the democratic example they have set for the world." However, the final word may be up to ultranationalist Avigdor Lieberman, a former Netanyahu protege and perhaps Israel's most divisive politician, whose rightist Yisrael Beiteinu emerged as the third-largest faction, with 15 seats. Lieberman says he wants to redraw Israel's borders to push out heavily Arab areas and require Arabs who remain to sign a loyalty oath or lose the right to vote or run for office. Some 20 percent of Israel's 7 million citizens are Arabs, and about a dozen serve in parliament. Lieberman kept his options open. "We want a right-wing government," Lieberman told party activists, but added that "we do not rule out anyone." Nearly everyone seemed to agree on one thing after Israel's fifth election in a decade - that the nation's fractious election system isn't working. Livni, Lieberman, and Defense Minister Ehud Barak of the Labor Party said in post-election speeches that the system, in which votes are splintered among a proliferation of parties, must be changed to allow more stability. Netanyahu has derided the past year of peace talks under Kadima as a waste of time, and said he wants to focus on reviving the Palestinian economy. He has also called to crush Hamas, the Islamic militant movement that seized the Gaza Strip by force in June 2007, and remove it from power. Livni has said she would continue peace talks with moderate Palestinian President Mahmoud Abbas, who governs from the West Bank. But she also advocates a tough line against Hamas and was one of the architects of Israel's three-week Gaza offensive, which ended with a temporary cease-fire on Jan. 18. Abbas will restart talks only if Israel commits to a settlement freeze, his aides said Tuesday, posing such a condition for the first time. Netanyahu wants to expand settlements, and even under the outgoing Kadima-led government, in which Livni served as chief negotiator, construction accelerated. The Palestinians want all of the West Bank for a future state, along with Gaza and east Jerusalem. They say the West Bank settlements, home to nearly 300,000 Jews, will make that impossible. It was not immediately clear whether the prospect of weeks of political paralysis would lessen chances for a long-term Gaza truce and a prisoner swap between Israel and Hamas. Under the proposed exchange, Israel would free hundreds of Palestinians for an Israeli soldier held since June 2006 by Hamas-allied militants. Prime Minister Ehud Olmert, freed from concerns about political fallout, could approve a deal before the new government is sworn in. A swap is linked to efforts to reach a permanent truce on the Gaza-Israel border. Hamas wants Israel and Egypt to lift their blockade of Gaza, while Israel wants a halt to arms smuggling into the territory.